©2018 BREEZE PUBLICATIONS INC. 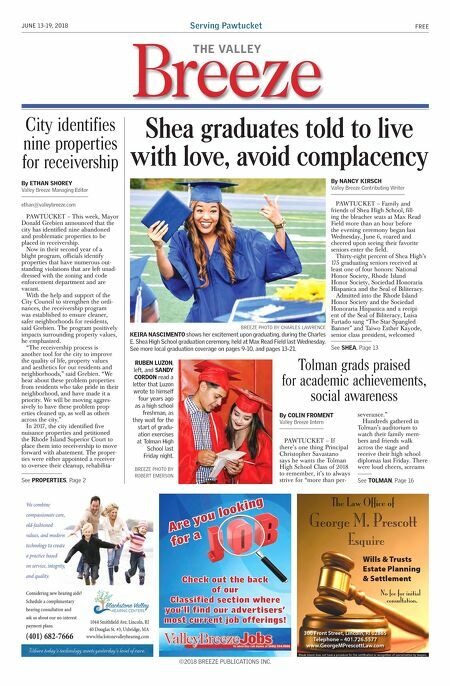 Serving Pawtucket Breeze THE VALLEY FREE JUNE 13-19, 2018 BREEZE PHOTO BY CHARLES LAWRENCE KEIRA NASCIMENTO shows her excitement upon graduating, during the Charles E. Shea High School graduation ceremony, held at Max Read Field last Wednesday. See more local graduation coverage on pages 9-10, and pages 13-21. BREEZE PHOTO BY ROBERT EMERSON RUBEN LUZON, left, and SANDY CORDON read a letter that Luzon wrote to himself four years ago as a high school freshman, as they wait for the start of gradu- ation exercises at Tolman High School last Friday night. PAWTUCKET – Family and friends of Shea High School, fill- ing the bleacher seats at Max Read Field more than an hour before the evening ceremony began last Wednesday, June 6, roared and cheered upon seeing their favorite seniors enter the field. Thirty-eight percent of Shea High's 175 graduating seniors received at least one of four honors: National Honor Society, Rhode Island Honor Society, Sociedad Honoraria Hispanica and the Seal of Biliteracy. Admitted into the Rhode Island Honor Society and the Sociedad Honoraria Hispanica and a recipi- ent of the Seal of Biliteracy, Luisa Furtado sang "The Star-Spangled Banner" and Taiwo Esther Kayode, senior class president, welcomed Shea graduates told to live with love, avoid complacency By NANCY KIRSCH Valley Breeze Contributing Writer PAWTUCKET – This week, Mayor Donald Grebien announced that the city has identified nine abandoned and problematic properties to be placed in receivership. Now in their second year of a blight program, officials identify properties that have numerous out- standing violations that are left unad- dressed with the zoning and code enforcement department and are vacant. With the help and support of the City Council to strengthen the ordi- nances, the receivership program was established to ensure cleaner, safer neighborhoods for residents, said Grebien. The program positively impacts surrounding property values, he emphasized. "The receivership process is another tool for the city to improve the quality of life, property values and aesthetics for our residents and neighborhoods," said Grebien. "We hear about these problem properties from residents who take pride in their neighborhood, and have made it a priority. We will be moving aggres- sively to have these problem prop- erties cleaned up, as well as others across the city." In 2017, the city identified five nuisance properties and petitioned the Rhode Island Superior Court to place them into receivership to move forward with abatement. The proper- ties were either appointed a receiver to oversee their cleanup, rehabilita- City identifies nine properties for receivership By ETHAN SHOREY Valley Breeze Managing Editor ethan@valleybreeze.com See PROPERTIES, Page 2 See SHEA, Page 13 PAWTUCKET – If there's one thing Principal Christopher Savastano says he wants the Tolman High School Class of 2018 to remember, it's to always strive for "more than per- severance." Hundreds gathered in Tolman's auditorium to watch their family mem- bers and friends walk across the stage and receive their high school diplomas last Friday. There were loud cheers, screams Tolman grads praised for academic achievements, social awareness By COLIN FROMENT Valley Breeze Intern See TOLMAN, Page 16 Wills & Trusts Estate Planning & Settlement The Law Office of George M. Prescott Esquire Rhode Island does not have a procedure for the certification or recognition of specialization by lawyers. 300 Front Street, Lincoln, RI 02865 Telephone – 401.726.5577 www.GeorgeMPrescottLaw.com No fee for initial consultation. Are you looking Are you looking for a for a Check out the back Check out the back of our of our Classified section where Classified section where you'll find our advertisers' you'll find our advertisers' most current job offerings! most current job offerings!